• For quantitative determination of phosphate and evaluation of drug effects on phosphate metabolism. • Sensitive and accurate. Linear detection range 0.3 μM (0.0028 mg/dL) to 50 μM (0.47 mg/dL) phosphate in 96-well plate assay. • Simple and high-throughput. The procedure involves addition of a single working reagent and incubation for 30 min. Can be readily automated as a high-throughput assay for thousands of samples per day. • Improved reagent stability and versatility. The optimized formulation has greatly enhanced reagent and signal stability. Assays can be executed in cuvet or 96-well plate. • Low interference in biological samples. No pretreatments are needed. Assays can be directly performed on raw biological samples i.e., in the presence of lipid, protein and minerals. • Phosphate (Pi) is one of the most important ion species in nature. Phosphate is present in all biological systems. It is a major constituent in minerals and fertilizers, and is a component of industrial wastewater. Thus accurate determination of phosphate concentration finds numerous applications in pharmacology, biomedical research, clinical chemistry, industrial process monitoring and environmental monitoring. Simple, direct and automation-ready procedures for measuring phosphate concentration in biological and environmental samples are becoming popular. BioAssay Systems phosphate assay kit is designed to measure phosphate ion directly in samples without any pretreatment. The improved Malachite Green method utilizes the malachite green dye and molybdate, which forms a stable colored complex specifically with inorganic phosphate. The intensity of the color, measured at 620nm, is directly proportional to the phosphate concentration in the sample. The optimized formulation substantially reduces interference by substances in the raw samples. 1. Is the assay able to detect condensed phosphate? Our assays detect ortho-phosphate only. Condensed phosphates such as pyrophosphate or other polyphosphates first have to be hydrolyzed in order to be detected. In aqueous solutions condensed phosphates will gradually hydrolyze into ortho-phosphate depending on their concentration. Thus, when using samples that contain condensed phosphates in solution only the part that has been already completely hydrolyzed into ortho-phosphate will be detected. If the user wants to determine the total phosphate content of the sample, condensed phosphates have to be completely hydrolyzed (e.g. by acidification) before assaying. 2. Can #DIPI-500 can be used for measuring the phosphate concentration in in edible meat? If you have the any information about sample preparation for solid sample, please let us know. We have not validated the kit with meat samples but it will work just fine. - If you want to measure free inorganic phosphate, I would suggest homogenizing the sample in water, centrifuging the homogenate and using the clear supernatant for the assay. - If you want to measure total phosphate content in meat, you have to first digest the sample, e.g. with nitric acid first, then filter the digest and use the neutralized digest in the assay. 3. I would like to have an information concerning the Malachite Green Phosphate Assay Kits. I am not sure if it is possible to detect the liberation of Pi from activated amino sugars without hydrolysation of the activated groups (e.g. because of acidic conditions). The POMG-05K kit contains 12% sulfuric acid, which when diluted in your reaction mixture is 2.4% sulfuric acid. As the color reaction is completed within 10 min, the hydrolysation of the activated groups may not be so fast, if it happens. However, as we have not done this test here, you could check it by doing a pilot experiment: mixing 2.4% sulfuric acid with your substrate for 10, 20, 30 min, analysis the reaction mixture on HPLC to see if there is any hydrolysation. 4. Could you tell us if this kit can be used for samples in acidic solution (HCl, H2SO4, and 10%TCA)? Our kit can be used with acidic samples. But make sure that the acid does not contain phosphate. HCl and H2SO4 are fine. TCA usually contains residual phosphate. 10% TCA may contain 20 μM Phosphate ion, so this would give higher background. It may be used, but a "sample" control containing the same amount of TCA must be assayed together and subtracted from the sample value. It is recommended to dilute the sample containing TCA prior to the assay, so the amount of TCA is less than e.g. 2%. 5. What is the difference between your 3 phosphate assays: DIPI-500, POMG-25H, POPB-500? All three products are based on the malachite green dye. While the PiBlue (POPB-500) and QuantiChrom (DIPI-500) Phosphate Assay Reagents are identical, they differ in the standards. The PiBlue is designed for customers who want prepare a full calibration curve for their assays, and the latter has one set of a blank control and 30 µM phosphate standard. The reagent is more diluted than the reagent used in the Malachite Green Phosphate Assay Kit (POMG-25H). As a result, one adds 100 µL reagent (POPB-500 or DIPI-500) to 50 µL sample, whereas for the Malachite Green based assay, one adds 20 µL Reagent to 80 µL sample. In practice, the DIPI-500 is the most convenient kit to use, because there is no need to prepare a calibration curve there is no need for extra mixing. Because adding a larger volume (100 μL) to a small volume (50 μL) effects efficient mixing in well, no extra mixing is needed. The POPB-500 requires preparation of calibration curve. With the POMG-25H Kit, one needs to mix the reagent with the sample, because adding 20 µL to 80 µL does not mix efficiently by itself. Also a preparation of a standard curve is necessary. 1. Chung YI et al (2007). Enhanced bone regeneration with BMP-2 loaded functional nanoparticle-hydrogel complex. J Control Release 121(1-2):91-9. Assay: Phosphate in Rat bone (Pubmed). 2. Abranches, J (2008). CcpA regulates central metabolism and virulence gene expression in Streptococcus mutans. J Bacteriol. 190(7):2340-9. Assay: Phosphate in Bacteria cellular ATPase (Pubmed). 3. Jubeck B et al (2008). Promotion of articular cartilage matrix vesicle mineralization by type I collagen. Arthritis Rheum. 58(9):2809-17. Assay: Phosphate in Human collagen (Pubmed). 4. O’Connor RD et al (2009). Mecp2 deficiency decreases bone formation and reduces bone volume in a rodent model of Rett syndrome. Bone. 45(2):346-56. Assay: Phosphate in Mouse tissue (Pubmed). 5. Dunbar, DR et al (2009). Transcriptional and physiological responses to chronic ACTH treatment by the mouse kidney. Physiol Genomics. 40(3):158-66. Assay: Phosphate in Mouse urine (Pubmed). 6. Ponda MP et al (2010). Moderate kidney disease inhibits atherosclerosis regression. Atherosclerosis. 210(1):57-62. Assay: Phosphate in Mouse tissue (Pubmed). 7. Galitzer H et al (2010). Parathyroid cell resistance to fibroblast growth factor 23 in secondary hyperparathyroidism of chronic kidney disease. Kidney Int.77(3):211-8. 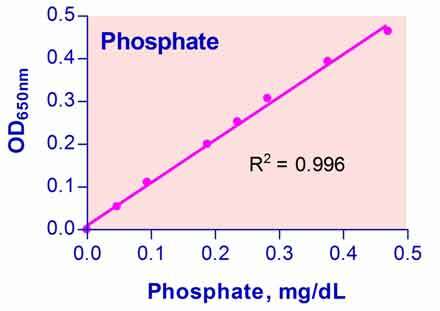 Assay: Phosphate in Rat serum (Pubmed). 8. Hildebrand, J et al (2009) Functional and energetic characterization of P-gp-mediated doxorubicin transport in rainbow trout (Oncorhynchus mykiss) hepatocytes Comp Biochem Physiol C Toxicol Pharmacol. 149(1):65-72. Assay: Phosphate in Fish Trout hepatocytes (Pubmed). 9. Xie J et al (2010). Comparison of media used to evaluate Rhizobium leguminosarum bivar viciae for phosphate-solubilizing ability. Can J Microbiol. 55(7):910-5. Assay: Phosphate in Plant tissue (Pubmed).